Ugh. 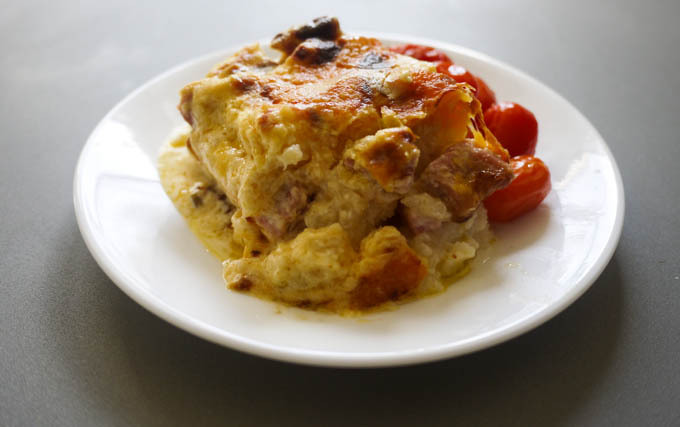 Can we talk for a minute about this stupid name – Zesty Cauliflower Ham and Cheese Casserole. I was trying to convey that this wasn’t just a cauliflower version of mac and cheese. That it’s different and has a little kick to it because of the addition of a lot of sour cream and scallion. But the only word that comes to my mind to describe it, and I wish there was another word that could get the job done, was “zesty.” Ugh, so lame! Lol! 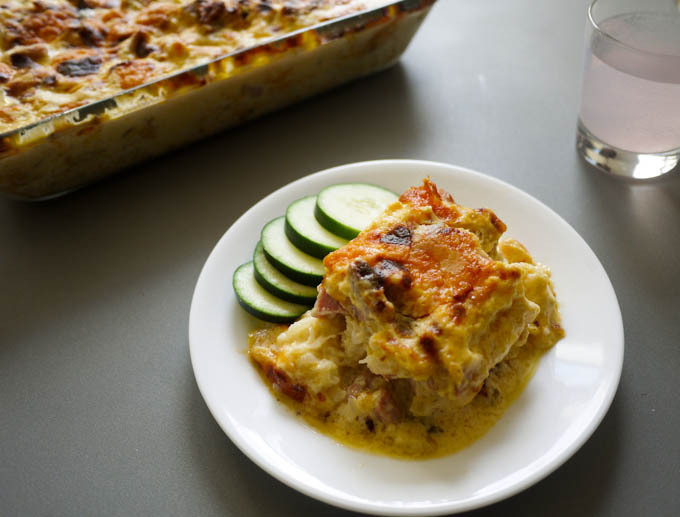 Well, this is adapted from Lost Sentiment’s Cauliflower Mac and Cheese with Ham Casserole. This is perfect for potlucks, to take to a new mom or sick friend, or for making lunch for the week. It eats like a meal. 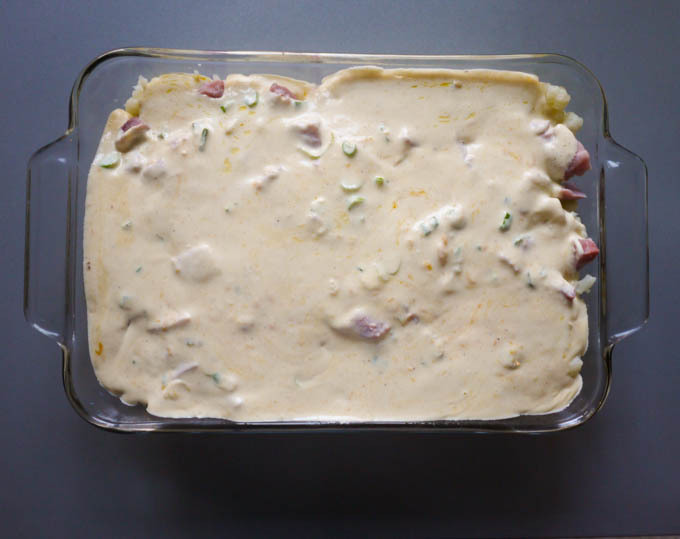 Chunky cauliflower topped with cubes of cooked ham and drenched in a cheesy sauce before being baked until golden brown. Boil cauliflower until fork tender, approximately 10 minutes, and drain. 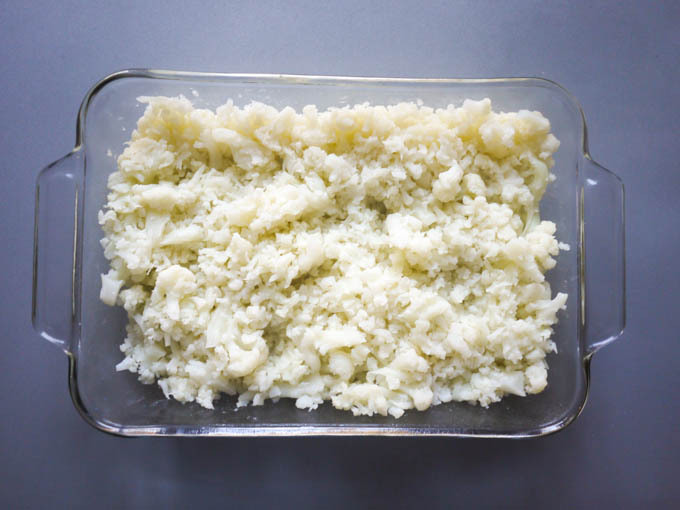 Using a fork or a masher, lightly mash the cauliflower and spread it along the bottom of a greased baking dish. 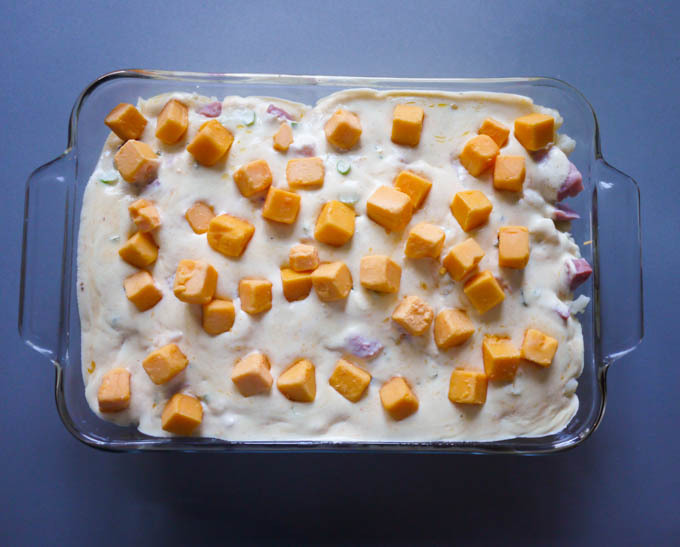 NOTE: Be sure to use a deep baking dish so that as the casserole cooks in the oven, the cheese sauce doesn’t spill over. 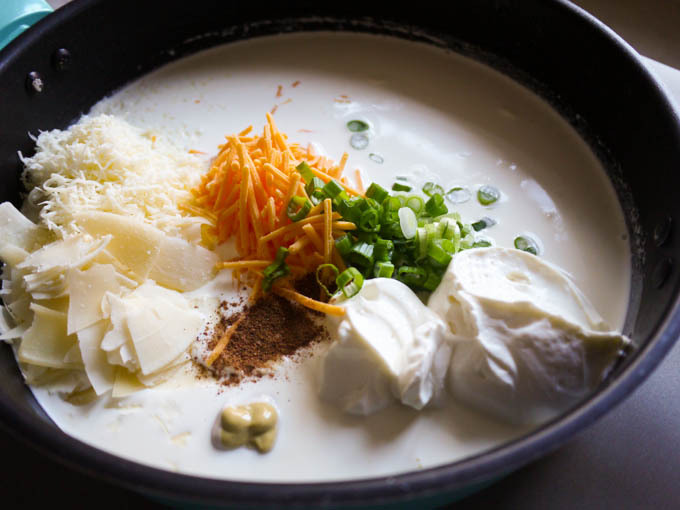 In a skillet, add heavy cream, sour cream, mustard, nutmeg, scallion and the shredded cheeses. Cook on medium low until it forms a light cheese sauce, approximately 3 minutes, stirring continuously. 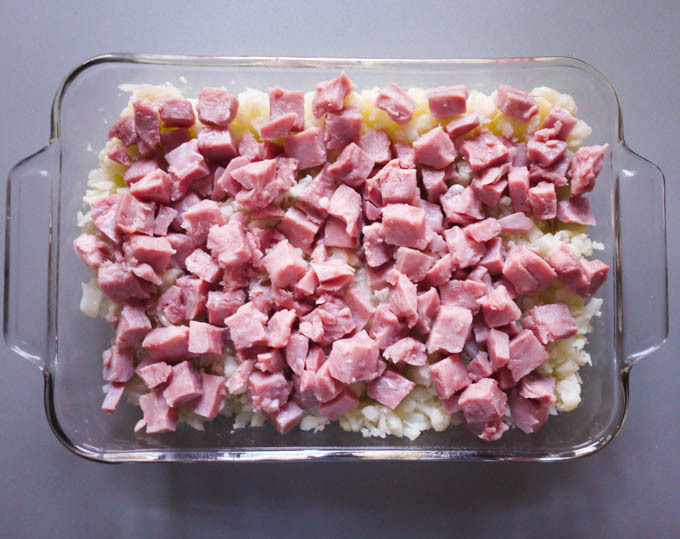 Pour the cheese sauce over the ham cubes. Top with cheddar cheese cubes. Wiggle a knife throughout the dish so that the cheese sauce can also get down to the bottom of the baking pan. Bake for 40-45 minutes, until top is golden brown. This looks so good. And, wouldn’t you know I found a big chunk of ham in our freezer over the weekend! What a lucky coincidence.